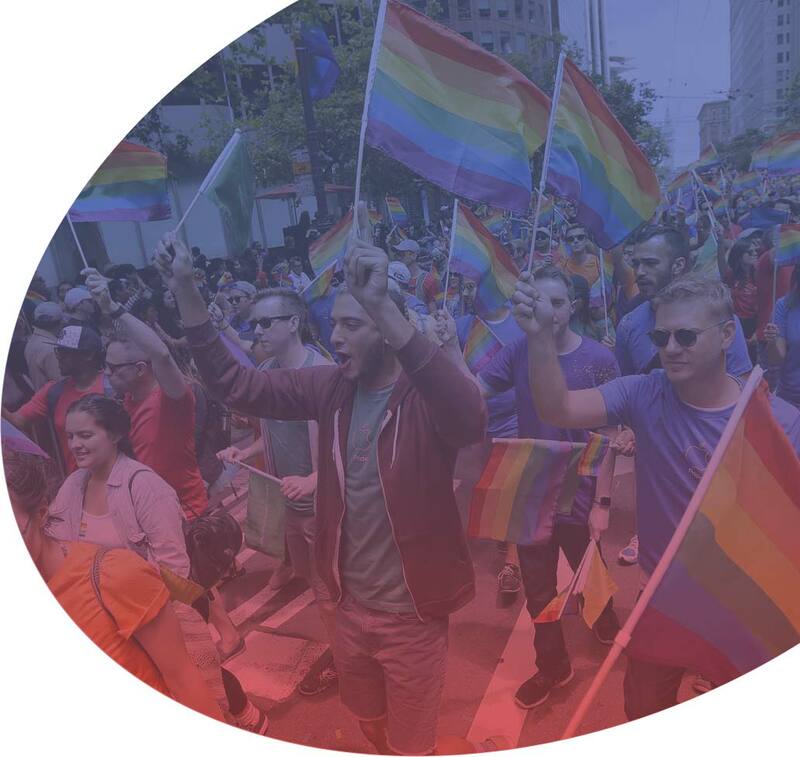 What Pink Banana Media does is bring together the conversations and relevant content related to your LGBTQ/LGBTQ-friendly business, where we participate in and become an active part of these social media conversations out where they are happening live, in real-time on Facebook, Twitter, Instagram, etc. As a business, we are participating in these conversations, identifying which individuals and brands are strongest in this specific niche market relevant to your business, as well as determining who are the bloggers, vloggers, influencers and various video content creators dominant in this space. Our intent and our goal is to interact with, work with and leverage their activity and user-generated content for your campaign. Entry-Level Facebook & Twitter Targeting: Offering highly targeted advertising to reach your company's LGBTQ demographic. 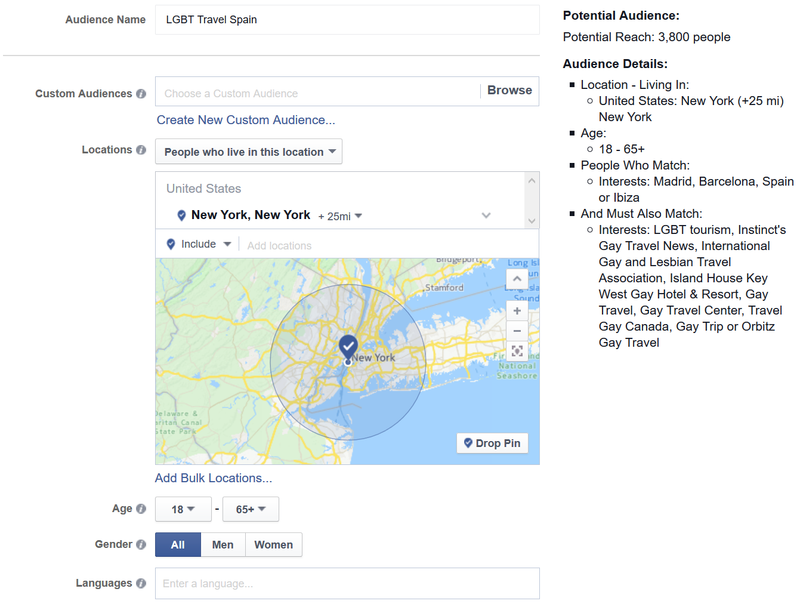 In the following example shown below, this targeting selects individuals living in the New York City area, 18-65+, who have shown an interest in Barcelona, Madrid, Ibiza or just Spain in general, AND show an interest in LGBTQ travel. Layering these interest data sets together allows us to target gays men and/or lesbian women who would like to travel to Spain. 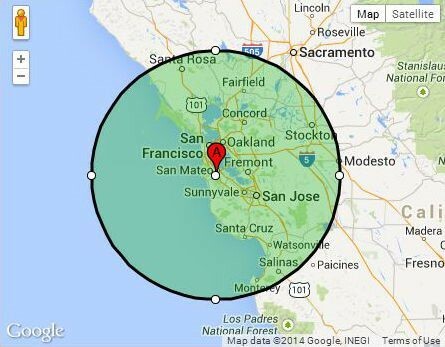 This type of targeting allows us to focus on your key demographic like never before. Costs starting at $500 per month. 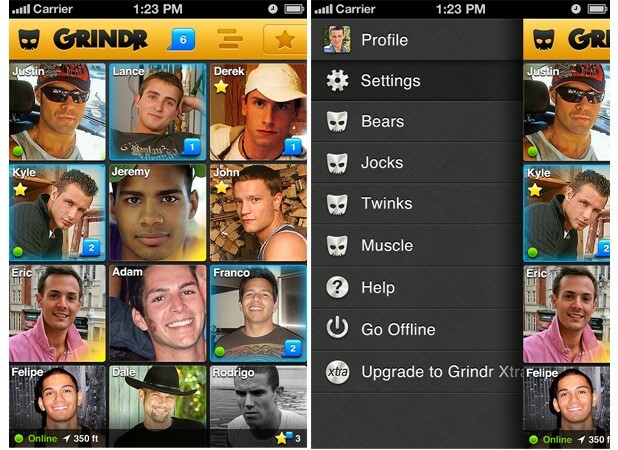 Entry-Level Mobile & Banner Ad Targeting: Offering highly targeted advertising to reach your company's LGBTQ demographic on mobile apps such as Grindr, Scruff & Hornet, as well as sites including Huffington Post Gay Voices, Gay Star News, Gay Ad Network, Pride Media, Q.Digital, Pink.News, Towleroad.com and more. We've had a resurgence in e-mail campaigns here at Pink Banana Media this year... with an LGBTQ consumer list now up to 95,000 names and growing, we're able to target your audience based on REGION, as well as CATEGORIES such as Travel, Sports Lovers, Foodies, Theatre-lovers and more. Monitoring and measuring campaign using reporting tools such as TweetReach.com, Twitter Analytics and Facebook Insights. 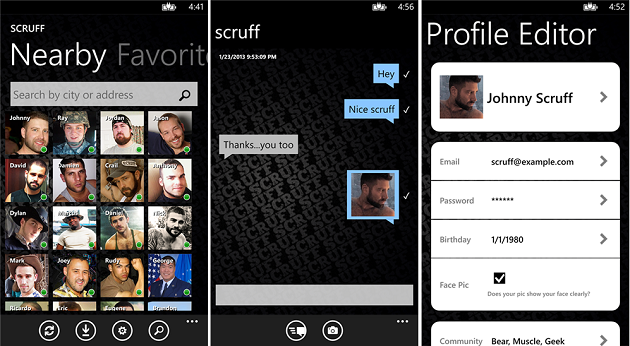 To be the Best Hub for all LGBT social conversations related to a specific region or theme. What is our goal with #ILoveGay to Businesses? To be the Best Brand to work with when targeting the LGBTQ community online, blending influencer marketing, content marketing and social media, as well as traditional online strategies. 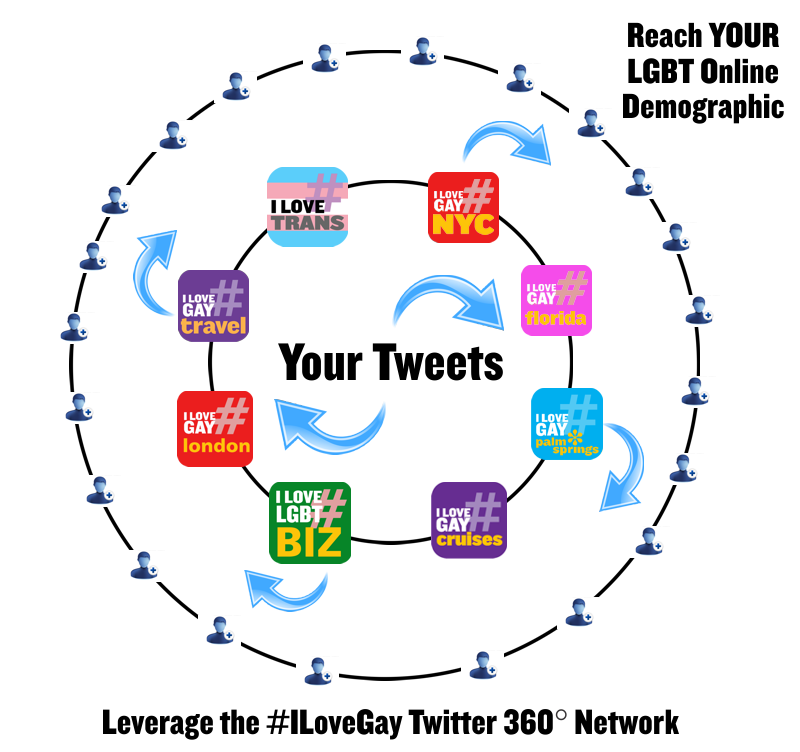 #ILoveGay Twitter 360° Network: From your Twitter profile, we would monitor your content DAILY, including artwork, posters, photos, links and videos, and rebroadcast select items through our #ILoveGay network, choosing #ILoveGay profiles specific to your content, such as @ILoveGayTV, @ILoveGayFoodies and @ILoveLGBTTravel, as well as some of our larger profiles including @ILoveGayLGBT. 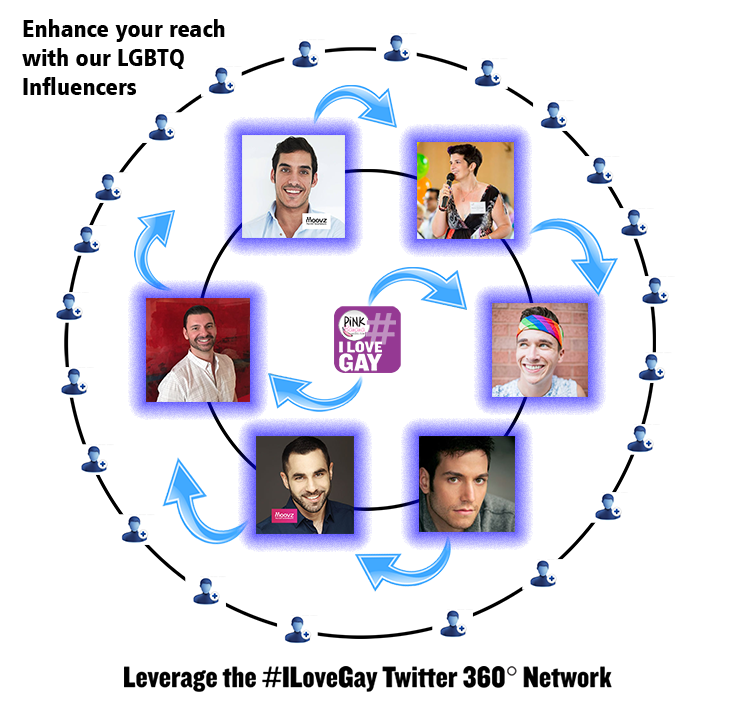 We would also share via #ILoveGay profiles based on the region your content is focused on, such as @ILoveGayLA, @ILoveGayNYC and @ILoveGayLondon. Social Media Reach from our #ILoveGay social media networks (including @ILoveLGBTTravel, @ILoveGayLGBT, @ILoveLGBTBiz, @PinkBananaWorld and @LGBTPinkieB) is now over 325,000+ followers on Twitter, Facebook and Instagram combined. Only with Pink Banana Media do we show you how to leverage the power of the individual to promote your brand with our state-of-the art interpersonal marketing techniques.